What Conditions Does a Pediatric ENT Treat? Your pediatric ear, nose and throat doctor can be a critical partner in the care of your child for most of their young life. ENT issues encompass a wider range of issues that many parents might expect, so here are some of the most common conditions they can help with. When we are young, our sinuses are still developing and prone to producing a lot of snot and mucus. This is supposed to flush the bacteria from our sinuses, but it can lead to some issues. Sinusitis is the inflammation of the sinuses, often caused by infections and can cause severe facial pain, tooth pain, a feeling of pressure or blockage, and headaches. The sinuses are connected directly to the ears. Too much fluid in the sinuses can cause it to back up into the ears. These are one of the causes of ear infection and inflammation which can lead to a wide variety of problems, from severe pain to abscesses and even balance issues like vertigo. An ENT specialist can take a closer look at the outer and middle ear to see the cause and provide both medication and surgery as and when they are needed to solve the problem. The visual examinations that a pediatric ear, nose and throat doctor can provide, as well as their ability to conduct hearing tests, make them the perfect specialists to evaluate signs of hearing loss, as well as potential causes. Furthermore, ENT specialists can provide a range of speech and language therapy solutions for children who have problems with speech delay, stuttering and other speech difficulties. Some of these problems can be related to an ear infection and otitis media, the blockage of the ear due to fluid backup. Tonsil surgery is one of the most common procedures a pediatric ear, nose and throat doctor will recommend. 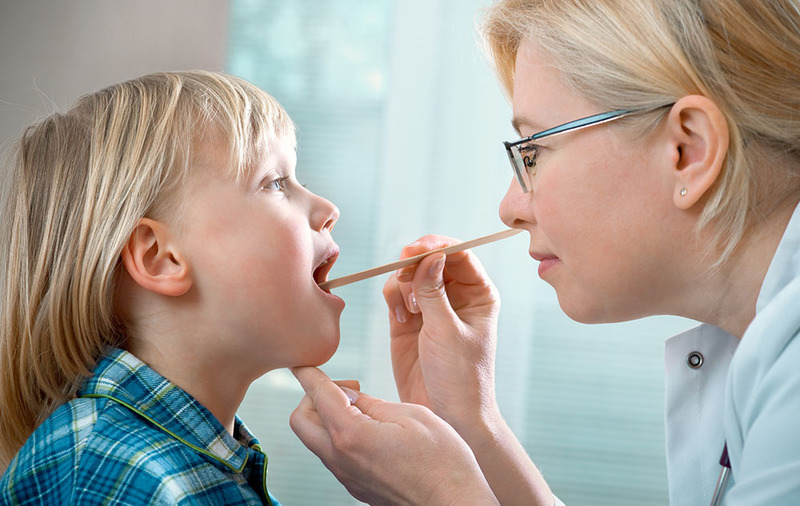 Children can have a variety of issues with their throat and tonsils that this surgery can help immediately relieve. This includes a chronic sore throat, tonsil pain or infections. The issue is chronic if your child experiences these symptoms more than five times in one year. Furthermore, enlarged tonsils can cause sleep apnea, where they block the airway as they are sleeping, leading to sleep deprivation and potential blood pressure issues down the line. Many children have trouble swallowing not just solid foods, but liquids, medications and even their own saliva. An ear, nose and throat doctor can take a closer look to see if there are any obstructions or irritation in the throat and mouth causing any feeding or swallowing issues. From treating the causes to providing feeding and swallowing therapy, an ENT specialist can provide a lot of help. From runny noses and loud snoring to a variety of facial pains and inflammation, if your child shows symptoms of any issues related to the face or head, making an appointment with a pediatric ear, nose and throat doctor may be the best course of action. Santa Cruz ENT has two locations for your allergy shots. Please click the most convenient location below to see our allergy shot schedule. Take our quick Sinus Questionnaire to determine if you should schedule an appointment to help with your sinus issues.